Week 4 brought its fair share of injuries. Tyler Eifert may have suffered a career ending injury, while others like TY Hilton, Leonard Fournette, and Will Fuller may miss a few weeks with hamstring injuries. Maybe you had Ryan Fitzpatrick and now need to find a new QB after the magic finally ran out. No matter the case, there are always plenty of options out there. Here are some players to target after Week 4. Surprise surprise, Leonard Fournette is hurt again. And once again RB T.J. Yeldon was the beneficiary. Yeldon got the lead back duties in the 2nd half of Week 4's victory over the New York Jets, rushing 18 times for 52 yards and 1 touchdown and catching 3 of 3 targets for 48 yards and 1 touchdown. He did lose a fumble, but that probably didn't hurt you much if you happened to start him. With bye weeks coming and injuries taking their toll, Yeldon is a must add figuring Fournette will miss more time. The Jags take on a leaky Kansas City defense next week. This might be our first WHO?!?! addition of the season, but there is no ignoring this rookie in the Texans' offense. Keke Coutee came out of nowhere in Week 4, catching 11 of 15 targets for 109 yards. WR Will Fuller went out with a hamstring injury, and could miss time, meaning Coutee would be the 2nd WR in a high powered offense (remember Bruce Ellington is also hurt). Coutee was an early 4th round pick in the NFL draft, but missed the first three weeks of the season with a hamstring injury (meaning he would have been the third WR already). If Fuller does indeed miss time, Coutee could be in for a ton of work. Coutee can be added in 10-12 team leagues, figuring he'd still be the third WR on a pass heavy team. I've always liked Taylor Gabriel, but he was often overlooked thanks to WR Julio Jones and Mohamed Sanu. Now he has gotten at least 7 targets in the last three games in Chicago's offense. Gabriel caught 7 of 7 targets for 104 yards and 2 touchdowns in Week 4 against the Buccaneers. Normally you could say it's a fluke because they played an awful defense, but Gabriel has been one of the most targeted players on that team. I don't think QB Mitch Trubisky will throw 6 touchdowns every week, but it seems like this offense is starting to click. If it does, Gabriel will be in line for a lot of redzone targets it seems. He can be added in 12 team leagues. 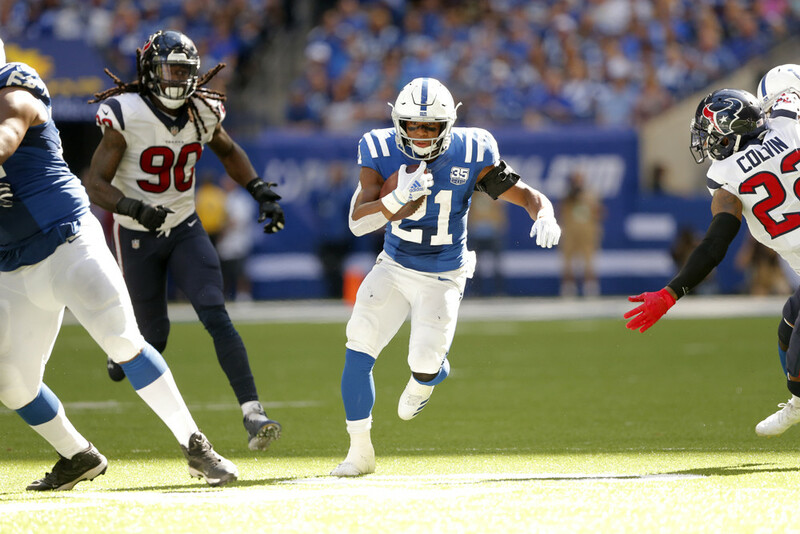 Nyheim Hines had a decent amount of hype this offseason, and many figured he could eventually lead the Colts' backfield. He showed why he was so hyped in Week 4, catching 9 of 11 targets for 63 yards and 2 touchdowns. He only rushed 4 times for 10 yards. So maybe he isn't the top rusher in the group, but he seems to be the best pass catching back on the team so far. Hines was a safety blanket for QB Andrew Luck, who doesn't seem to be himself so far this season. It also doesn't help Luck that WR TY Hilton left with an apparent leg injury, so he will have to find another target this coming Thursday night. Hines can be added in 12 team leagues, but be aware that both RB Marlon Mack and Robert Turbin, who looked great in preseason, will be back and may eat into Hines' touches. QB Andy Dalton has always liked to throw to the TE, and from here on out that TE will probably be Tyler Kroft. Kroft has always been the next in line when Tyler Eifert goes down, and unfortunately he may have a spot forever after Eifert went down with a gruesome ankle injury. Kroft really hasn't been involved so far this season, but the Bengals have a soft schedule for the next 5-6 weeks. He is more of a speculative add, but he could have some huge games ahead. Vance McDonald came onto the radar in Week 3 when he stiff-armed Chris Conte into oblivion. But now McDonald seems like a solid TE to grab off the waivers if you need someone to make it through the bye week (or injuries). In Week 4, McDonald was targeted 5 times, catching all 5 passes for 62 yards. That's not bad for a TE this year. McDonald is getting more and more work in the Steelers' offense. Hopefully the Steelers turn it around soon, but either way McDonald can be a decent fill in. Mike Davis is more of a speculative add this week. RB Chris Carson was a surprise inactive in Week 4, and Davis got a majority of the carries over rookie Rashaad Penny. Davis made the most of his opportunity, carrying the ball 21 times for 101 yards and 2 touchdowns. He caught all 4 of his targets for 23 yards. Davis provided a spark for the usual awful running game for Seattle, and if Carson misses any time he will be in for a lot of work. Don't spend a lot of FAAB for him, but Davis should be added. Who knows, he may even take over for Carson entirely based on how he performed. I hate to say it, but it seems Ryan Fitzmagic's amazing start is finally over. He was benched at halftime in the Buccaneer's 48-10 drubbing by the Chicago Bears. Winston, on his first game back from suspension, completed 16 of 20 passes for 145 yards, 1 touchdown, and 2 interceptions. Winston has shown flashes of QB-1 numbers in the past, and he has the weapons in that offense to be great. WR Mike Evans, Chris Godwin, and DeSean Jackson are all capable pass catchers. It wouldn't surprise me to see Winston put up 300+ yards and multiple touchdowns each week.